Indeed it is; the agora is the marketplace of a Greek polis. The word αγορά is from αγείρειν, meaning “to gather” or “to collect”, and is related to the words “aggregate” and “gregarious”. It’s the gathering place at the heart of a Greek city. And the city of Izmir hasn’t always been called that. Before it became a Turkish city, it had been Smyrna, a major Greek port and trading center for more than two millennia. Even after becoming part of the Ottoman Empire it remained a primarily Christian city, home to many thousands of Greeks and Armenians. Until 1922, that is. The week of September 11-17, to be precise. During that period the city was occupied by the forces of Mustafa Kemal, a.k.a. Kemal Attaturk. 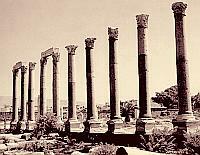 The Christian areas of the city were looted and torched, and the Armenians and the Greeks were driven from their homes to flee the city or be slaughtered. Of the 400,000 Christians resident in the city beforehand, virtually none remained, and more than 190,000 were never accounted for. The Archbishop Chrysostomos was among the victims, murdered at the hands of a mob while under the “protection” of French marines. The city, except for the Turkish quarter, was reduced to a smoking ruin. So here we are at yet another anniversary. Another 9-11, and also a 9-17. Let’s back off a little bit and look at the history of Asia Minor. Below is a map of the region in ancient times, as it was more or less in the time of St. Paul. Notice all the place names on the map. Those cities and regions were Greek, and had been for a thousand years. While St. Paul was making his way through Asia Minor to Corinth, the Turks were still a tribe of Mongol nomads in the Central Asian uplands. After the rise of Islam the Turks migrated to Anatolia, picked up Islam on the way, and succeeded where the Arabs had failed, conquering the Byzantine Empire piece by piece. The city of Smyrna fell first to the Seljuk Turks in 1084, was regained by the Greeks, and then later was conquered by the Ottoman Turks. It remained in Ottoman hands until modern times, but was still primarily a Greek and Armenian city, home to thousands of Christian dhimmis. At the beginning of the 20th century there were an estimated 4.5 million Christians in what is now Turkey, most of them Greek. In 1979 the Greek Orthodox population in Turkey was thought to be no more than 7,000, and is now down to about 2,000. Where did all those Greeks go? Demetrios didn’t just turn to Sofia one day and say, “Darling, let’s load all our worldly goods onto the donkey cart and we’ll move to Athens or Thessalonica.” It’s not like Smyrna was proselytized by gentle imams who were so persuasive that the entire Greek population converted to Islam, gave up their Greek surnames, and took on Turkish ones instead. No, Asia Minor was cleared of Greeks and Armenians in the traditional manner, by blood and fire, by the sword and the bullet, by rapine and looting and unimaginable slaughter. But this didn’t happen in 670, or 1084, or 1453, or 1683. It was in 1922, in the recently departed 20th century. It was the Rwanda and Darfur of the 1920s, and it occurred within living memory. Or it would be living, if the memory of it hadn’t been dumped down the oubliette along with all the other inconvenient facts that the bien-pensants would rather not think about. When the “Sick Man of Europe” — the Ottoman Empire — finally expired at the end of the Great War, the formerly Ottoman lands were divided up by the Western Allies according to the national aspirations of the inhabitants as well as the mercantile schemes of the British and the French. Greece had won her independence from the Ottomans in 1821, but much of Asia Minor, though ethnically Greek, remained part of the Ottoman Empire until it was allotted to the Greek nation under the Treaty of Sèvres in 1920. The defeat at the hands of the Allies helped spark Kemal Attaturk’s “Young Turk” revolution that overthrew the Ottomans and replaced them with a secular Turkish nationalist government. In 1921 Greek forces secured Smyrna and moved inland to engage the Turkish nationalist army. Unfortunately, they were no match for their opponents, and were pushed back across the Bosphorus by the Turks. Any Greek civilians who failed to flee with them were left to face the revenge of Kemal’s army. The awful dénouement was realized most vividly in Smyrna. According to Western eyewitness accounts ( derided as “tall tales” by some Turks, but confirmed by other Turkish sources), Turkish soldiers methodically put the Greek and Armenian quarters to the torch when the winds were blowing away from the Turkish quarter. Christian homes and businesses were looted, Christian women were raped by soldiers while their families were slaughtered, and what remained of the Christian populace gathered on the quayside between the flaming city and the waters of the harbor. Like the people trapped on the upper floors of the World Trade Center, the Christians of Smyrna faced the choice of dying in the inferno or jumping. Many of them did jump, and those who could swim tried to reach the Allied warships anchored in the harbor. But the British and French seamen had orders from headquarters not to allow any refugees aboard. They cut the ropes and threw water onto the desperate Greeks trying to climb aboard, and many thousands of people drowned. Not our finest hour, eh? The Western Allies had read the writing on the wall, and could see that Kemal Attaturk and his genocidal soldiers were the wave of the future. Commercial interests were at stake, after all, so Attaturk got the assistance of the West, the Greeks were driven from Asia Minor, and the Treaty of Sèvres was discarded. The facts on the ground were codified by a new treaty, the Treaty of Lausanne, in 1923. The Greek Holocaust was a secular one, perpetrated by Turkish nationalists out to secularize the country, and not a product of jihad. Even so, the corpses strewn in the streets were all Christians, and were derided by their murderers as gâvur, the Turkish version of the Arabic word kaffir, or infidels. Asia Minor becomes Griechenrein. Turkey becomes a modern, secular, “European” state. The Turks flood Europe. And so we move on into the 21st century. Last week the Islamic Street rose in predictable outrage after Pope Benedict XVI mentioned a 14th-century Byzantine emperor’s remarks about the brutal and immoral nature of Islamic jihad. Bardakoglu said he expected an apology from the pope and said it was Christianity, not Islam, that popularized conversion by the sword, according to Turkey’s state-owned Anatolia news agency. “The church and the Western public, because they saw Islam as the enemy, went on crusades. They occupied Istanbul, they killed thousands of people. Orthodox Christians and Jews were killed and tortured,” he said. Regular readers of Gates of Vienna don’t have to be reminded that until 1453 Istanbul was Constantinople, a Greek city and the seat of the Eastern Empire. The Crusaders occupied it, and the Byzantines later retook it, before it was finally overrun, sacked, and converted by the Ottomans in 1453. The Turkish reaction is more than historical revisionism; it is absolute fantasy, on a scale that Big Brother could only admire. It would be laughable if so many in the West weren’t ready to buy into it, to accept the “Evil Crusaders” meme as gospel truth, to jump on the Pope for examining and restating the plain facts of history, and to turn their naked bellies to the swords of the Saracens, begging for dhimmitude. What have we come to? How could this happen? Let’s return to the agora. In a Greek city-state, the agora was at the center of public affairs, the open area where people gathered, business was transacted, and public debate occurred. Its Roman equivalent was the forum, and in the Hispanic diaspora it was the plaza. The American version would be the courthouse square. This is the Commons, the public space, the area of civic life shared by all citizens. In the 20th century its traditional forms in the West atrophied as modern forms of communication moved in. Radio and then television supplanted the agora, and the free-for-all exchange of ideas was replaced by a one-way communication. In contrast to a conversation in the square, the Chosen Few read the story into the microphone, and you, Mr. Average Citizen, listened to it through the speaker and accepted it as the narrative of the common culture. This worked fine as long as the person reading into the microphone and the person listening to the speaker shared the same values and assumptions. But for the last fifty years or so these two have diverged. The average person in the West holds very different values from the people whom Thomas Sowell has dubbed “The Anointed”, typified by the editors of The New York Times and the news anchors of network television. These latter folks are anxious to put one over on you, in order to serve the Common Good, which they, as the privileged minority, have been able to ascertain. Posse Incitatus knows the truth. So do Dave Schuler and Charles Johnson. But that truth is not going to appear on the nightly news or the front page of the NYT. 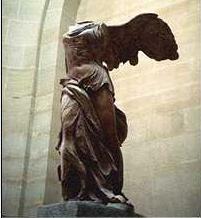 The agora was the transmission belt of our common culture, and the belt is now broken. The common values of our civilization are no longer being transmitted from generation to generation by the erstwhile guardians of the West. To switch metaphors a bit, the title-holders of our culture have defaulted on their obligations, and are about to be foreclosed on. The means to do so are at hand. Two major steps are necessary, and each is difficult in its own way. First of all, it’s time to kill your television. If you have children, this is a must. Television is the primary propagator of the destructive memes that are poised to bring down the decadent West. It doesn’t matter if you only watch “Masterpiece Theatre” or the Weather Channel: your television is a Trojan Horse, one that will carry everything you don’t want into your house and infect your kids with it. Secondly, pull your kids out of the public schools. If you spend a couple of hours reading about the fashionable and dangerous Marxist thought being poured into the heads of your kids’ teachers at the schools of education, you won’t hesitate to get your children out of reach of the school system. Make the necessary sacrifice: keep one parent at home and do the homeschooling. I realize that homeschooling can be quite difficult under the nanny states of some European countries and Australia, not to mention in some of the bluer states in the USA. But if it’s legal where you live, it’s a worthwhile thing to do. Make yourself into the cultural transmission belt, and your kids will be the better for it. Both of these prescriptions require sacrifice, but both are possible now, thanks to the internet. If your house has broadband and no TV, and if — most importantly — you monitor closely your children’s use of the internet, the information that flows into their impressionable little minds will be quite different from what enthralls and entertains the MTV-and-public-school crowd. The new media are poised to gather together the disparate strands of the despised traditional culture and weave them into something that can withstand the forces that would destroy us. Or, to use a genetic analogy, the legacy media are the dominant cultural genes, and the alternatives — the churches, the Boy Scouts, volunteer organizations, etc. — are the recessive ones. In times of stress on a population, recessive genes gain selective value and come to the fore. Information that was once hiding in the genetic shadows emerges now into the sunlight to save the species from extinction. If you pay attention to the legacy media, the culture of the West seems almost suicidal in its determination to submit to the Great Islamic Jihad. The élites of the Anointed are secure in their bastions in Scarsdale or Ann Arbor or Hollywood, and don’t have to fear for their own skins any time soon. They watch the tide coming in and knocking down the sand castles in Europe, but their little castles are secure. Or so they think. But there’s no place on earth that’s above the high tide line of Islam. In 1918, the fall of the Ottomans was the low tide of Islam. The Greek castles were way down the shore near the ebb, and they were the first to go when the tide turned. The castles in Nigeria, Kosovo, Kashmir, and Indonesia are falling now, and those in Sweden, the Netherlands, and Britain will topple soon. But none of our castles is safe. Ours may not fall in Dan Rather’s lifetime, or in mine. But some cohort of those alive today — people now in their 20s, or 30s, or 40s — will have to face this tide at its flood. It will be no use to emulate Canute and order it to turn back. The only way the West will be victorious is for us to take back the culture. We need to empower our heirs by driving pilings deep into the cultural foreshore so that our revered institutions will be strong enough to withstand the pounding of the coming tide. Something worth considering, I think, is the amount of time that certain influences have over your mind, measured in terms of hours. Compare and contrast the daily life of say, a New England Puritan, say 1790, to that of a professed Maryland Christian, today. How many hours a week does the latter spend in "entertainment" that is largely immoral, and amoral at best? That certainly affects that person's thought processes and value system. Factor in the nature of TV and movies (low-level narcotics) and you're not only abusing your spirit and your sense of community, but your body and mind as well. That is the long war that Christianity has faced in the last few centuries -- the replacement of the community and its spiritual component with the lure of the self and all its cocooning desires. There really is no other way to begin than to kill your TV. I haven't had one for years. Australia is probably a state with the least amount of nanniness. On what basis do you make this assertion. Incidentally, I am Aramean by heritage. Arameans tend to be Christians. We suffered enormously at the hands of both the Turks and Kurds as well. Thanks for picking this sad case of genocide. I don't think that Ataturk was one of the Young Turks. Also, didn't the Greeks invade Turkey first in the aftermath of WWI? Suffice it to say that the whole place was in chaos and while Ataturk was certainly no fan of Greeks or Armenians, and probably was sympathetic with ethnic cleansing, he certainly wasn't in a position to have ordered any wholesale slaughters as for much of the time he controlled only a small fraction of the country. The ethnic cleansing was also bi-directional: the Turks who lived in Greece were killed or re-located to Turkey as well. Actually, Ataturk's home town is now in Greece. I'm not saying the Turks were nice guys by any means, but the entire WWI era was nasty business. Ethnic cleansing to avoid future minority agitators was an accepted practice until recent times. The Allies even practiced it themselves after WWII when Germans were forcibly expelled from countries like Czechoslavokia. I didn't mention Australia out of the blue. I wish I could give you the link to the exact place I read aboout it, but I can't rememeber -- it might have been Tim Blair, or Jim Ball's site. It said that in Victoria (I think) the law had recently beren changed to make homeschooling more difficult. The person posting was an Australian woman. That's all I remember; maybe I got it wrong. Yes! Islam IS Perfect! Islam NEVER did anything wrong in its ENTIRE History. No Muslim ever harmed any innocent person, anywhere, ever. Every believer in Mohammad is ABSOLUTELY right, always. Mohammad's "marriage" to a 6 year old girl was WONDERFUL! (And taking her to bed when he was 54 and she was 9 was SPLENDID!) Islam is utterly INNOCENT, everywhere, and at all times! Muslims are always HONEST, LOVING, and intellectually straightforward and basically BRILLIANT when it comes to ANY aspect of religious thought, cultural meaning or historical insight. FGM rules! Their shameless and unendingly arrogance must be imploded by OVERLOADING its victimological B.S. with even MORE whiny, and MORE ABJECT B.S. apologistics back at them. OVER-agree with EVERY ONE of their egregious claims and ALL of their flatulently fraudulent criticisms of the West, of every infidel faith, and about the "undeniable" Crusader mentality that "poisons the dialogue" with the "poor Mohammedans". Mock them with overwhelming assent that is so fawning, so grotesquely lickspittle, so stupendously self-abasing and preposterously supine that it finally gets throught to the covert Islamic Imperialists that we see through the ridiculousness of their "Islam is and has always been completely blameless, peaceful, non-aggressive" claims. Hard History needs - from 622 A.D. onward- to be taught to Western children and no more feel-good fantasies of painless rainbows and multicultural myths. And Paleontology, to show that even Mother Nature has performed 5 global "Great Extinctions" during her rather ruthless career in shaping consciousness out of electified protoplasm. We need scholastic realists who understand that the survival of our vision depends on the strengthening of the sinews of the student- both literal and intellectual. Coddling our way to oblivion is cute, but mad. The pussyfooting curricula and self-eviscerating Press must die. According to Encarta, "Because of his activities in the secret Young Turk movement against the autocratic government of the Ottoman Empire, which was centered in what is now Turkey, Atatürk was posted to Syria, then also a part of the empire, in virtual exile." Do you have sources to contradict this? Concerning Attaturk's soldiers in Smyrna: if you'd followed my links, the wiki says this: "In 1922, the nationalist movement led by Mustafa Kemal Atatürk sought to revoke the Treaty of Sèvres following the defeat of the Ottoman empire in World War I. The treaty planned to cede parts of eastern Thrace and Asia Minor to Greece, including the city of Smyrna. The city was occupied on May 15th 1919 by Greece with Allied approval. By 1922, the Greek forces which had pushed into Anatolia were driven back to the sea and in September 1922 Smyrna was recaptured. Many Armenians and Greeks were killed when the Turkish army reoccupied Smyrna. While the historian Kinross referred to the deaths as individual and sporadic and placed the total at 2,000, Marjorie H. Dobkin reconstructs the first detailed account of the capture of Smyrna in her book 'Smyrna 1922'; she uses diaries, letters and eyewitness reports as sources. Her assessment is that the city was ravaged and destroyed by Turkish troops under the noses of Allied ships, which failed to help the civilian population, or even the refugees who swam out to their ships; for them, economic interests in Turkey were at stake." 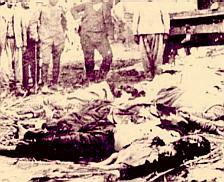 Attaturk's troops gained control of Smyrna in September of 1922, which is when the massacre happened. The Greeks had been ceded the Asia Minor coast by Sevres, and attempted to extend their control to the interior. That was their big mistake. And I didn't say that the Turks were the only ones ethnically cleansing their territories in those days; in fact, I mention some of the others. Smyrna is just the place I chose to shine my spotlight on during its anniversary time, especially since this incident has been largely forgotten except by those of Greek heritage. Which strike a terror to my fainting soul. I associate the Young Turks with the Enver, Talat and Cemal triumvirate. They took power in a 1913 coup until the post-WWI period. It was really they who were behind a lot of the Armenian slaughter, which, btw, was mostly well before 1922. The Wikipedia article on the Young Turks doesn't even mention Mustafa Kemal Ataturk. Later, the remnants of the Young Turks were rivals of Kemal Ataturk. Most of my knowledge comes from the Kinross biography of Ataturk, but I don't have the book handy to consult. Kemal was certainly active during the period as a military officer and the like, but I would not have considered him a Young Turk. With all due respect, if your knowledge of the history of Turkey comes principally from Encarta, assuming that is indeed the case, you probably aren't knowledgeable enough to write an article with the claims you make. to see the area around Smyrna and why even that enclave of Greek control was manifestly unsustainable. The Turks clearly went beyond the bounds of what we'd consider the laws of war, but that was par for the course in that era. I think you're far too hard on the Turks and this blog entry is very unfair. What's more, the idea that Greco-Roman ruins mean that the territory is Greek in nature is not one I'd agree with. I've been to Izmir and toured the magnificent ruins at Ephesus (which is memorialized on what used to be the 20,000,000 lira note and in the national beer Efes). That city was not built by today's Greeks any more than the pyramids were built by today's Egyptians. The best one can say is that Asia Minor was part of classical Greece, who form one leg of our cultural forebears (the Hebrews being the other). Of coure before that parts of it belonged to the Hittites and other civilizations. Populations change and migrate over time - the Greeks themselves migrated into their area. Come to think of it, that's how we came to own the United States. The presence of some 2000 year old ruins signifies nothing, though of course they are part of our cultural heritage as well as the world's and we should expect the Turks to respect them, which indeed they do. I'm generally a big fan of Gates of Vienna, but this article does not live up to the standards I've come to expect. I would recommend more thoroughly researching the history of the late Ottoman/early Turkish national period before making such one-sided postings. I believe this blog article is one where the Turks/Muslims would have a legitimate right of complaint. It also, btw, doesn't seem to have any particular flow, as you go from a picture of an agora to "pull your kids out of public school" and "kill your television". The points you are trying to make about the today's public forum did not require a lengthy, gratuitous Turk-bashing essay to put forth. You could have cut straight from the agora photo to "In a Greek city-state...."
I'm sure my knowledge is not as extensive as yours, and I'm sorry that this post is not up to my usual standards. I shall ever strive to improve my work and so gain your approval. Fortunately, I did not use Encarta to source my post. I just happened on that one when I googled the topic. I saw at least 12 separate sources mentioning Attaturk as being in the Young Turks; google it yourself and you'll see. My sources were mostly what I indicated in the links at the bottom of the post, though I did read some other pieces, including some in print that are not online. The facts of the genocide are plain and well-attested. I admit to being an amateur, and my work is undoubtedly flawed compared with that of the experts, but I believe that the broad outline of my post is accurate. As for your complaint about the flow of my post, that's a matter of taste. I just received an email from a woman of Greek descent whose grandparents just barely escaped the genocide. She reports that their story matches my outline. But, of course, they must have been lying, since the whole thing is a fabrication, anyway, right? BTW, she understood the flow of my narrative, since she tells me that she homeschools her children. More power to her. All Australian States are currently governed by the centre-left Labor Party. It would not surprise me if Victoria was wanting to make home-schooling a more difficult option. After all, it was the Victorian Government that decided to prosecute to Christian pastors for vilifying Islam on the basis of a lecture they gave to a Christian audience. However, the Federal Government is by no means nurturing a nanny-state. It is the Feds that have cut taxes significantly, wound back a frivolous social security system, liberalised the labour market, sold off Fed government enterprises, etc, etc. The State Governments have been doing their best to encourage nanniness on their part. However, just for record, the State Governments get most of their tax revenue from the Feds. Australia as a nation is absolutely not a nanny state. You are right. I unfairly slandered the great nation of Oz. In my own defense -- I realize that Australia, like the USA, has variation among its states. If you referred to the homeschooling laws in, say, Maryland as being stringent, that would be true. But it would not reflect ill on the Commonwealth of Virginia, which regulates homeschooling very lightly. In any case, no offense meant towards Australia, a stalwart ally to the USA and a beacon of liberty in a dark world. I'm glad to see that some members of your government are willing to go against the PC tide and speak the plain truth. I'm sure we could debate this all day and all night and get nowhere. So I'll conclude with just one general remark. Let's assume that everything you say happened as you say it did. It's hard to see the relevance today. It happened in a very different political climate, and no one in Turkey today likely had anything to do with it. Dredging this stuff up is like Osama bemoaning the tragedy of al-Andalus. Let's not play the Muslim nurse-the-historical-grievance game trying to out-victim the victimologist. Yes, we should understand history, and especially the role it plays in shaping contemporary Muslim thought. But we should base our actions on today's realities, not what happened Turkey a 100 years ago or Spain and Contantinople 500 years ago. All right; there's something I can agree with. 2. To highlight the absurdity of the accusation made by the head Islamic dude in Turkey. That gave the Smyrna massacre (and many others) a timely relevance. I feel the need to combat disinformation with accurate facts (within the limits of my amateur ability), and that means dredging up some ancient history. If the MSM version of history is not to become ascendant, we bloggers, in our own slipshod way, must make up the difference. Keeping the lefties from getting away with re-writing history is a cause I can heartily endorse. Baron, that is one *wonderful* post! Any objection to me exceprting parts of it for my blog, with attribution? Manny and Baron, re homeschooling here in Oz, it has recently become more difficult here in Brackistan (Victoria). We had one of the more free states on that front, with there being no requirement to register at all, and if you were taking your child from the schooling system, a letter to the school was pretty much all you had to supply. These days, with the nannies tightening their grips, it is becoming tougher. I'm too lazy to link at this time of night, and I don't think is the place for it, but new legislation has been passed which supercedes the Acts that covered education in the past. This has only happened this year. Being a product of the Bracks government, it was, needless to say, brought in with not a whole lot of fanfare. Particularly with respect to home-ed. There has been some discussion of it in the homeschooing mailing groups, but I've been too busy with work and study to pay any real attention to it and have let it slip by. Queensland and NSW, off te top of my head require homeschoolers to register, although not everyone does. While I'm currently reconciled to the fact that my rugrat will end up in the school system, I've got her on the list for the local catholic primary. Also, as her birthday is in July, she is not allowed to commence before 2008. The longer I can keep her out of the system the better. The trick is to apply myself now, keep her in family daycare while I get up to speed and start socking away money. I really, really don't think any child should be allowed within spitting distance of our "public" schools. Manny, I'm with you on Oz not being a nanny state, per se, but with dhimmis such as Iemma and Bracks, it's pretty bloody painful on the State level. Actually, I love Melbourne, and I've never wanted to live anywhere else, but I'm dreading the State election in November. The Liberal Party (the conservative side for non-aussies) are a dog's breakfast, the Green Party (say no more) are the usual pack of lefty nutjobs, which leaves Family First for my consideration. I'm predicting that Labor (the current mob in power) will win, but with a reduced majority. There are a lot of unhappy Lib voters, a few of those will go FF. Sorry to stray so far off topic, Baron. We do need the "memory holes" filled in. Not to "understand" the poor victims but to appreciate that the present manisfestation of the "war" is as you state, just the next phase in an on-going war waged against Christianity and the Western world. The enemies at and inside of the gates live and breathe this "history". It stokes their fires of hatred and revenge. So much easier to - in tribal war - to whip up your 'Arab-street' with the hatred of the past. "We're gonna get them for what they did to great-great-great-grandma." The only thing the current Arab-street has to rebel against is the 'cult' that has kept them as an afterthought in current "cultural" advances. They revise their past to insight their masses because they have nothing "new" to point to as success. It's like the Baptists and Methodists quibbling over this or that interpretation of orthodoxy. Only, it is much more deadly to us, to our way of life today. So, I appreciate the 'history' lessons, the perspective, and the simple directions - kill the TV and homeschool. The war we are in is the next battle in a war which will continue with its ebb and flow until one of the combatants dies or is totally contained. Really, I have no desire for Christian missionaries to even try to "save" the non-believers in the Middle East or other Muslim nations. God did his Saul-Paul thing, so He can do his "ah-hah" moment with the Muslims. I just don't want islam in the Western world. I know, freedom of religion and all. We've got to get beyond seeing islam as a religion. Thanks for throwing some light into the memory holes. Please keep doing that. A sausage for the Ramadan. Excerpt away; that's what it's for! And thanks for asking. Stupendous ideoblogging as usual, Baron. Your competition keeps driving me more and more. Baron--Thank you for this excellent article on one of my favorite areas of study. Dissenters--Smyrna and it's destruction IS important still today. Smyrna was a very culturally rich city, boasting varying districts of many nationalities, in fact, one of the few cities that far East to have a substantial population of Western Europeans living there. The fact that the slaughter there happened in the aftermath of war and during a time of factionalism and invasion (Greek and Turkish) does NOT diminish the fact that the Christian population was systematically slaughtered within a few days. In modern parlance, that is what we would call a "war crime". Yes, the Greek Army had marched. And it was conquered. That doesn't necessitate the murder of all of the non-combatants, including children and Clergy. Greeks from Asia Minor did have to flee in whatever manner they could. Most did not end up in the disorganized population swap that happened. Most left in a trickle to all parts of the world, most under assumed names, starting in the late 1800s when the attacks on Greek communities became intolerable. Even on the now Greek island of Lesbos. I myself learned my own family name (on one side of my Ionian Greek family) just TWO YEARS AGO, only knowing the assumed name that our family had taken while fleeing. I have written it before and will again here now. It is my talisman in a way, THEODOSIOU!!! The one thing I can reclaim from these slaughters, for thankfully my family retained their dignity through it all. Baron, you don't have a rank for nothing! Thanks again! "Turn off the TV, &c.; The common values of our civilization are no longer being transmitted from generation to generation by the erstwhile guardians of the West." I do what I can to remind people that what we see today is one of the results of Antonio Gramsci's work. You may have to dig a little, but you'll find that his goal was to get rid of the traditional notion of the family, and get rid of Christianity (he probably disliked all religion - because it offers something outside ourselves). Oh, c'mon; SURE there's an agora - only it's called the "Blogosphere" now, and the prominant citizens are, oh, say, for example, Baron Bodissey and Dymphna. Where else would we find out about things like the Turkish genocide etc. etc. etc. In the government-run schools? Did you ever wonder why? Did you ever wonder why the Method of Choice in our government-run schools has become "Dumb 'em down, and fill 'em up (with Political Correctness unopposed by reason)? Did you ever wonder why homeschooling has become so popular, along with the tutorial centers such as Sylvan and Hunter? I can't resist telling you, but I'll try to be brief; many of you may have heard that a guy named Horace Mann was the political power behind the establishment of the government-run schools in the very early 1800s. Mann had some influence on the direction taken by the schools, but his influence on the philosophy of education couldn't BEGIN to compare with that of a fellow you may never have heard of - William Torrey Harris. Harris was a leader of the St. Louis (MI) Philosophical Society in the early 1800s; shortly after Mann's government system began to displace private education, he became the Superintendant of Schools in St. Louis, and later, the U.S. Commissioner of Education. None of this would have been important if the St. Louis Philosophical Society hadn't been for dedicated followers of the German philosopher Hegel. And what was so important about that? Consider this: Plato came before Kant who came before Hegel who came before Marx and his buddy Engels. All of these guys espoused the theory of the state where a ruling elite was in control of the Great Unwashed (that would be you and me). To them, the State was like an organism, while the individual was disposable, like an organism's cell. That was the origin of the infamous "Organic Theory of State." The other philosophical arm came from Plato's pupil, Aristotle. They had a major falling out, and barely spoke after that. Aristotle came before Ibn Rushd (that's a story in its own right) who came before Acquinas who came before Locke, who influenced the Founders of the United States and the authors of the Constitution. In contrast with Plato et al, this line of thinkers considered the individual and his rights to be supremely important, and government's - the State's - sole legitimate function was to protect the rights of the individual. So what happened? Well, in 1527, at the request of Martin Luther, a tax-supported, compulsory-attendance school system (complete with truant officers) was established in Germany. See, not everyone agreed with the ideas of the Reformation, and Luther recognized that if his ideas were to stick, he would have to influence entire generations of school children very quickly, and it seemed to him that a compulsory educational system with a curriculum devoted to teaching Lutheran piety was the way to go. Horace Mann, for reasons too long to go into here, was also convinced that nothing less than the salvation of the Republic lay in the establishment of a government-run system. No sooner had Horace Mann established the government-run school system, than various statist groups, including the Hegelians of the St. Louis Philosophical Society, saw it as the best means of firmly planting their postmodernist ideas into the little heads of our kids. They got into the act almost immediately, and they've been busy at it ever since. The NEA (along with some well known Foundations) is the biggest "power behind the throne," and has been pushing statist-leftist-globalist policies ever since the turn of the 20th century. That they succeeded by the 50s became apparent in the anarchist riots, flag-burning, and hedonistic flower children of the 60s, and it has been downhill ever since. Home schooling is absolutely the only way to do an end run around the Kantian/Hegelian etc. government-run schools. In fact, it's so effective at that that in Belgium, homeschooling is illegal. It was the government-run system, with its postmodernist statist philosophy, that has made so many of our people so vulnerable to Islam. Islam had a brief encounter with the Greek philosophers, especially (via neoplatonism) Plato. That's not so hard to understand - after all, like the other political systems of the Platonic ilk, it favored totalitarianism. There's more to it, of course, but at root, that's why so few on the Left see a big problem with Islam, and see a much bigger problem with America. At root, they are "brothers under the skin." The postmodern Left has had its way with our kids for about 175 years. What I find so amazing is that so many of us have survived the onslaught of postmodernism at all. Just the teensy-weensy bit of exposure we have had to Enlightenment principles has carried us through a fiercely fought War on Reason, yet some of us have come through it pretty well. The special beauty of home schooling is that because it educates with so much greater efficiency than the government-run institutions, in an hour a day, it can not only "un-do" the idiocy that passes for education in our schools, it can replace it with education of the sort that produced the Founders of our country and the authors of the Constitution. Re: the TV - for God's sake, don't turn it off (unless the kid is under three); where else can you find such grist for the homeschool mill? There are lessons galore to be had on TV! Oh, and if you can't homeschool, don't despair; just spend 30 minutes or so a day with your child AFTER his indoctrination at the government place. Thanks for the information about Mann etc. -- there was a lot in there I'd never heard of before. Well... that was actually my point; only I guess I was too subtle in not saying it explicitly. As for the TV -- I don't agree. It's pernicious, and it doesn't matter what's on it. Read Jerry Mander's book; he'll show you what the research reveals. People, especially young children, are neurologically damaged by too much TV. I had heard about TV having the potential to damage the neurological pathways in young children, and I thought very hard about whether I should allow mine to watch any or not. In the end, we do have the tv, but she has a collection of videos and dvds that she is allowed to watch. I figure that she needs to be conversant with the technology to hand, as it's not going to go away. We read every day, and we've started doing workbooks. The thing I also like is that she's started writing her name on her own, can recognise every letter in the alphabet and can count to 100. PRetty good for someone just turned 4. And that's with no kindergarten, no pre-school. Just family daycare, which is effectively babysitting in someone's home. I know what she watches, and what she reads here. I'm starting to introduce her to the computer, but mainly for pictures to illustrate points and one or two little games to get her used to the mouse. She's not into the pc, and I'm encouraging that line of thinking so far. One other factor in the development of mass government schooling was that it freed up parents to enter the workforce during the Industrial Revolution. I hadn't heard of the Hegel connection, but it doesn't surprise me in the least. Our culture definitely needs to be retaken, and we have to protect our children from the system that is currently in place. Let's face it, that system is doing us no favours. Smyrna: Smyrna was not a primarily Christian city throughout Ottoman times. Actually greeks were a small minority until 1830 when Greece gained its independence from Ottoman Empire. After this date there was continuous migration from Greece to Turkey (Asia Minor) because of unemployment and weakness of Greek economy. As a result of that, throughout the 19th century the population structure of western Asia Minor cities changed in favor of Greeks; like Smyrna where Greeks came to 80 percent from a mere 20 percent. 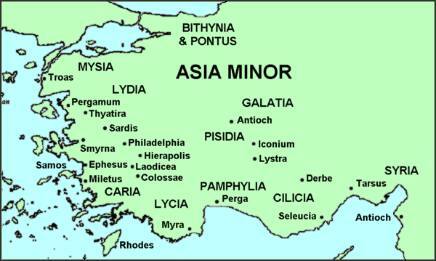 Asia Minor cities: It is very false to claim those city names (and their inhabitants) as Greek. Most of those names are meaningless in Greek language because they come from very old civilizations like Hittites who once reigned Asia Minor. Young Turk: The error here is very serious as Ataturk was the leader of the nationalist movement, not the Young Turk movement, and he tried hard not to lose the control of his nationalist movement to rival Young Turks. Though he was a member of the Young Turks when they were founded, this was for a very short time, as Young Turks did not like him and the reason he was in Syria was because of another small movement he had founded against the Sultan. Ataturk overthrew the Ottomans-Sultanate in 1919-1920 who had regained power from the Young Turks. The name Istanbul:Ottomans called Istanbul "Konstantiniyye" (same as Constantinople) as they were proud to be his successors. "Istanbul" was probably a name preferred by common people and it was legalized after 1923, with Turkish Republic. Istanbul Occupation: Istanbul was indeed occupied, looted and ruined by Crusaders at the begginning of the 13th century. Ottomans simply seized a city with half the poplulation as it was and completed the half-finished destruction by crusaders. The Greek existence in Asia Minor did not end with Smyrna (Izmir massacre) in fact but with the so-called "population exchange" which the two countries namely Greece and Turkey are said to have agreed to exchange their minorities. These were a million Greeks in Turkey and a half million Turks in Greece. This exchange was unfortunately mandatory for the people concerned, and altough the Greek part initially went into great economic and social burden, would soon reap the benefits as the new-coming population was a highly skilled and westernized breed of people. They played sigificant role in the anti-king movement of Greece, and democratization of the country. There are many mistakes that need to be corrected elsewhere in the article, and many thnigs to be added, but I cannot do this. For example the Turks did not simply push open the doors of asia minor with their swords -but they were welcome by indigenous Christian people like Armenians who were at odds with the Byzantines because of their own independent church. Later, when whole Asia Minor was conquered, these indigenous Christian people (meanwhile they were not Greeks, they were just Christian people!) converted to Islam (for various reasons, for example for tax advantages)and formed the core of todays population of Turkey. So, the old Christian people of Asia Minor were not all beheaded, they mostly converted to Islam! Sorry I cannot give references to all I have written now, but most can be verified from many resources available and they are simple subjects for 7th grade Turkish history books. Ataturk was keen to be leader of the nationalist movement. He was in Syria, where another small movement he founded against the Sultan. Ramadan 2006. Burn, Rinse, Repeat. Gates of Vienna on WND! What is the Nature of Multiculturalism? Is Al Qaeda the New UN? Will Canada Deport an Apostate Back to Pakistan? What would Stonewall Jackson Do?